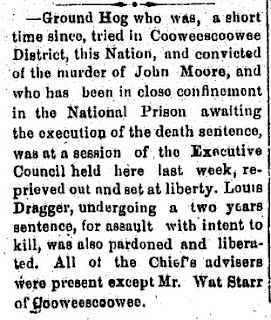 Source - The Cherokee Advocate; Tahlequah, Oklahoma; September 19, 1884. So, there we have it. Apparently, Groundhog was convicted of the murder of John Moore and sentenced to death, but then later received a reprieve and was set free. Is this the same Groundhog who was the stepson of my third great grandfather, Dave Tadpole? I still don't know, but I am continuing to research and will post updates as I learn more.